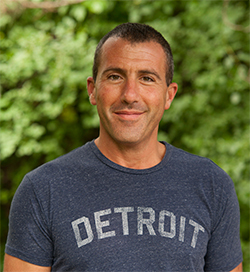 As a lifelong outdoorsman and hunter,CEO of HealthRise Solutions, founder and chairman of Carbon Media Group and a principal in NAI Farbman, New York Times® best selling author David Farbman has spent his career hunting success in commercial real estate, online media and healthcare. David’s insightful ability to leverage his connections, relationships and skills has helped him to build and grow three successful companies while developing a motivational platform so others can follow in his wake. David uses the skills learned through a lifetime of hunting to track down targets in the fields, business and life. His book, The Hunt: Target, Track and Attain Your Goals, is a field guide for anyone looking to increase the success of their hunt. David knows there is more than one way or strategy to accomplish goals; the path is as personal as the objective. Currently sitting on the Executive Board of Young Presidents’ Organization, David has also served as a board member of DMC/Harper Hospital’s Board of Trustees, the Southeast Region Board of the YMCA, the Economic Development Corporation and the Detroit Regional Chamber. He was a founding member and past chairman of Beyond Basics, a nonprofit organization devoted to improving literacy rates among public school children. David has been named one of Crain’s Detroit Business’ 40 Under 40, dbusiness’ 30 in their 30’s, one of Crain’s Most Powerful People and a Champion of the New Economy by Junior Achievement of Southeastern Michigan and was nominated for Ernst & Young’s 2014 Entrepreneur of the Year. As a proven business leader with energy and vision, David has the ability to turn breakthrough moments into breakout moments, inspiring groups from Quicken Loans to the Mule Deer Foundation at the 2014 Western Hunting Conference. There are five key elements to The Hunt: Consciousness, Authenticity, Leverage, Real Time Execution and Flow. David’s ability to get above and clear, find calm in the fray and see the pivots in his path give him the unique vision to help others on their hunt. He and his wife, Nadine, have three young boys: Hunter, River and Fischer. The boys inherited their father’s love of the hunt and are already passionate morel mushroom hunters. David is a graduate of Michigan State University and currently resides in Bloomfield Hills, Michigan.